Raid your enemies, win cows and the game! 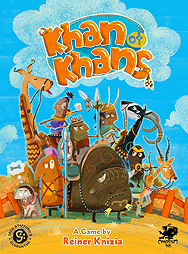 Khan of Khans is Reiner Kbnizia's fast-paced game for the whole family, set in the mythic world of Glorantha (RuneQuest, King of Dragon Pass). Everyone plays one of the khans of the great tribes of Prax, sending raiders into the rich green uplands of Dragon Pass. This year, the high priestess has decreed which ever khan brings back the most wealth from Dragon Pass in the form of cows will be declared "Khan of Khans", the paramount Khan of Prax! But watch out for stampedes, enemy magic and other players trying to steal your cows!